Individuals experiencing homelessness in Phoenix often struggle to find a place to turn to when facing circumstances that leave them on the street. And there are many families who are just one pay cut, on job loss away from being on the streets themselves as they struggle to pay rent and keep up with basic bills. 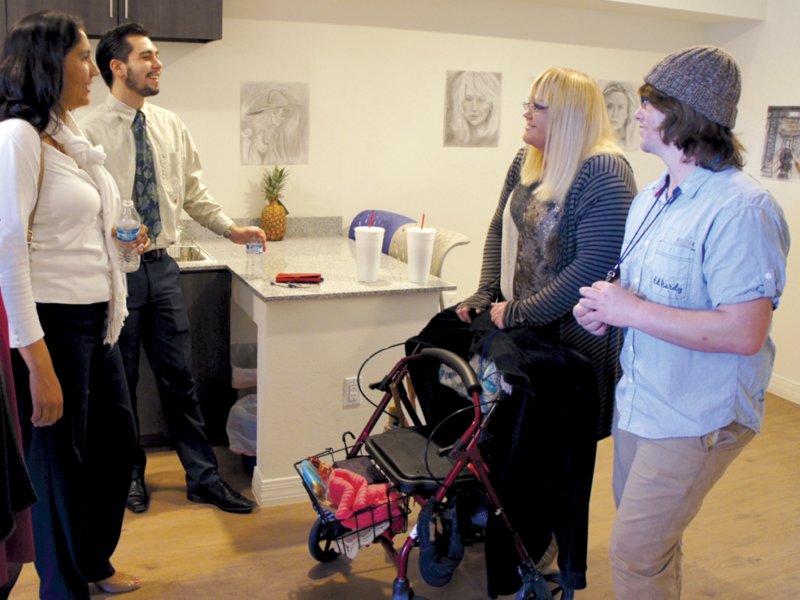 Maria Pina, left, and Martin Valencia of Maricopa Association of Governments (MAG) chat with LaRae Gonzales and Jeffrey Noell, two of the first residents to move into the new Camelback Pointe studio apartments for chronically homeless single people, built and operated by Native American Connections. The grand opening was celebrated on Jan. 18, where guests were invited to tour the units and meet some of the residents (photo by Teri Carnicelli). Two Phoenix-based nonprofits are working to find long-term solutions for those who are on the streets, or just steps away from being out in the cold. One has opened a new apartment complex to serve single, homeless men and women, and the other is in the process of building new apartments for lower income families. Native American Connections (NAC), Mercy Care Plan and Mercy Maricopa Integrated Care (Mercy Maricopa) on Jan. 18 officially celebrated the opening of Camelback Pointe, a new 54-unit supportive housing community for single, homeless individuals, located at 1537 W. Camelback Road. Permanent supportive housing allows individuals to live independently while having access to cost-effective and on-site services to support them through relapse, loss of income, daily living skills, and serious physical health and general mental health issues. For Camelback Pointe residents, it has been an answer to a prayer. LaRae Gonzales, 50, desperately needs surgery on her hip. She has been living on the streets for more than 2 years after she was evicted from her apartment because of issues with her adult son, who was living with her at the time. With no money to pay the first month’s rent and deposits on a new apartment, and with an eviction on her record, she wound up outdoors. She and her companion, Jeffrey Noell, 30, spent most of their nights in the parking lot behind Catholic Charities on 7th Avenue just south of Camelback Road. They were approached many times by social service agencies offering to find a bed for Jeffrey—there typically are more available for single men than single women. But Jeffrey refused to leave LaRae alone, with her disability making her even more vulnerable to potential predators. When someone approached them about Camelback Pointe, they were told that each of them could be given a studio apartment there. They jumped at the chance, and now live one floor apart. They moved in November 2017, and are grateful to be off the street, and still be together. Whether through employment or government benefits, residents are required to pay for a portion of the rental cost each month. To help with other income challenges, there is a food pantry on site that residents can partake of twice a month. Camelback Pointe is a “Housing First” community, a model that works to get homeless people off the street quickly and then connect them to important services after they are placed in stable housing—services like life-skills training, job-search assistance, drug counseling, and more. “In Arizona and in Phoenix in particular, there is a significant need for permanent supportive housing in general and for singles in particular, and so I think we’re just filling a much-needed gap for the type of community member that needs more structure, that needs more investment to achieve housing stability,” said Andrea Hipps, NAC affordable housing specialist. Mercy Care Plan and Mercy Maricopa provided over $200,000 in 2017 to help fund 13 of the 54 studio apartments in the central Phoenix complex. The overall project cost was $13 million. It replaced an abandoned fast food restaurant site that had become a problem property. LISC Phoenix helped NAC purchased the land. UMOM New Day Centers, a provider of shelter, housing and services for people experiencing homelessness, has broken ground on a new, affordable, 54-unit apartment complex in the central Phoenix neighborhood known as 19 North. The neighborhood follows the stretch of 19th Avenue roughly from Dunlap Avenue south to Montebello Avenue. The new $16.6-million complex, which will also go by the name “19North,” will replace an underdeveloped, vacant lot along Morten Avenue east of 19th Avenue. The location is close to light rail, bus stops, grocery stories, schools and jobs, making it an excellent option for families emerging from homelessness. “There is no question Phoenix has a significant demand for affordable housing,” said Darlene Newsom, CEO of UMOM New Day Centers. “This development will make affordable apartment homes available to families who earn 40 to 60 percent of the median income for the area. Without this kind of affordable housing, the people often end up in unsafe or inadequate housing, far from school or work. “19North will move 54 families out of that cycle and put them on a sustainable path toward permanent housing,” she added. The 19North apartments will offer energy-efficient, fully equipped two- and three-bedroom apartments on a campus that includes a community room, a picnic area with tables, an exercise room and a playground, with ample parking for tenants. There will be on-site recreational and after-school programming for children, as well as family services including GED tutoring and wellness programs. The development has been funded in part by Low Income Housing Tax Credits offered through the city of Phoenix. The first families are expected move into 19North in early 2019.